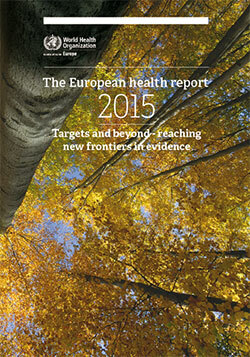 The publication of the European health report every three years is an opportunity to focus on progress towards genuine health and well-being for all. Whether the reader is a policy-maker, a politician, a public health specialist or journalist, the report gives a vital snapshot of health in the WHO European Region. It shows trends and progress towards the goals of Health 2020, the European health policy, and reveals some gaps in progress, inequalities and areas of concern and uncertainty, where action must be taken. The 2015 report shows that improvements in health continue throughout the European Region, and some of the inequalities in health between countries, notably in life expectancy and infant mortality, have decreased in recent years. In real terms, however, these differences still amount to 11 years of life and 20 healthy babies per 1000 live births between the best- and worst-performing countries. Absolute differences between countries remain unacceptably large, especially for indicators linked to social determinants of health. In addition, the report clearly shows that the European Region still has the highest rates of alcohol consumption and tobacco smoking in the world. looks at how WHO could use information from non-traditional sources – for example, drawing on history and anthropology –to gain a more complete picture of well-being in Europe. Health 2020 includes notions such as community resilience and a sense of belonging and empowerment, and requires fresh thinking about health information to ensure that the evidence collated meets the needs of the policy. The entirety of the information chain is fraught with challenges: from data collection to analysis, interpretation and reporting, and the use of information in policy-making. This report calls for broad international cooperation to focus attention and effort on harmonizing, setting standards for and creating evidence fit for use in the 21st century. Users can work with the data presented in this publication in WHO/Europe's European Health Information Gateway.